Another contest from Nido: create strong, educative poster with a tagline! Today we launch the second contest from Nido - this one is for designers and illustrators! 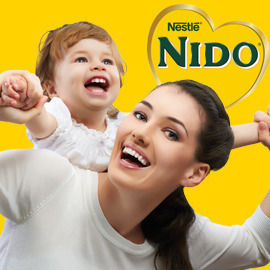 NIDO from Nestlé offers dairy based products that provide specialized nutrition to cover the most important nutritional needs of each stage from 1 to 5 years old. And that is something that ordinary liquid milk can’t do. Moms should be aware of this. And we need your help to do it! Create a strong, educative poster with a tagline, that explains to moms how in life, it’s always better to get what’s best for you, like Nestlé NIDO is the best Specialized Nutrition for children. Send your posters till January 13, 2015 23:59 UTC! Good luck!